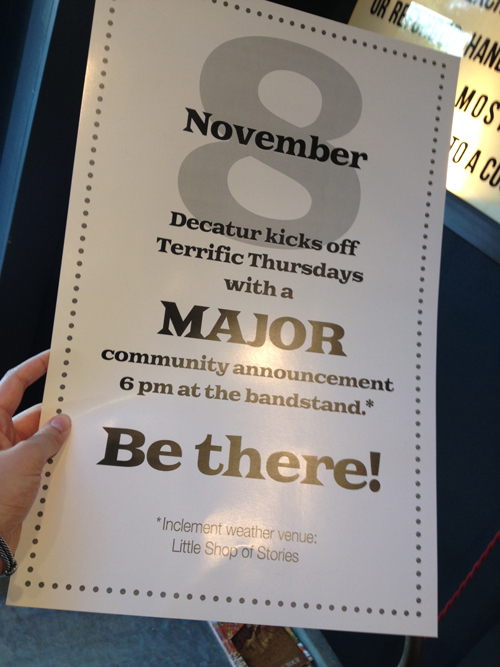 Looking for The Decatur Minute? We’re starting the new year with a new location. Find us here: TheDecaturMinute.com. Be sure to update your bookmarks accordingly so you don’t miss a single Minute! The City of Decatur will join with cities in Henry County and other cities throughout the state by ringing church bells 26 times on Friday, December 21 at 9:30 a.m. in memory of the twenty children and six adults lost in the tragedy in Newtown, Connecticut. All churches and institutions with bells are invited to participate to help us show the people of Newtown that we share in their grief. If you have no bells to ring, then please pause at 9:30 a.m. on Friday to think about the 26 victims of this tragedy and those who knew and loved them. Small Business Saturday was a rousing success last weekend. We gave out over 75 gift cards to Decatur restaurants, folks got their gifts wrapped free, and enjoyed the music playing from the bandstand. It was so successful that we decided to keep the tent and open it on this week’s Terrific Thursday, Nov. 29 from 5 – 9 p.m. If you spend $200 in a Decatur shop in November and bring us your receipts, we will give you a $20 gift card to a Decatur restaurant. Hurry, though, because Friday is the last November shopping day! See you Thursday at the tent! Based on the direction of the 2010 Strategic Plan the proposed recommendations encourage community gardens, allow for shared parking in commercial areas, update regulations dealing with accessory dwellings and provide new standards for transitions between residential and commercial properties. Bean Work Play Cafe is a co-space for parents and kids – where parents can work and kids can play. They are located at 134 New Street and are open Monday – Friday from 9 a.m. – 5 p.m. I receive their e-newsletters and the latest one intrigued me with its special Fall Classes for kids including children’s yoga, introduction to theater, sing-along with Ms. Carol, and Exploring Art. Children’s Yoga with Ms. Sonata is open to kids from 3 – 6 years and teaches kids to practice basic yoga poses and learn how to gain strength in using these poses in patterns and routines. Cost is $90 for a 6 week session. Introduction to Theatre with Shelby Hofer is an introduction to scripted text, live performance, collaborative storytelling, character development and the basics of acting. Participants work with PushPush Theater and Film Co-founder Shelby Hofer through a series of games that are physical, loud and high-energy. Cost is $96 for a 6 week session with a maximum class size of 6 children. Sing-Along with Ms. Carol includes singing and musical instruments including guitar, egg shakers and more. Song themes include the winter holidays of many cultures such as Diwali, Thanksgiving, Hanukkah, Christmas, Kwanzaa, and more. And, finally, Exploring Art with Ms. Kingsbury for ages 4-7 will let children explore a variety of art processes and materials to encourage and explore the visual arts. They say children will have fun, get messy, and gain confidence in their creative choices. Bean Work Place Cafe is an exciting new concept and well worth taking the time to visit the space. I understand they rent out their room(s) for birthday parties also. Even if you don’t sign up for the classes, you should stop by and just see the place.